[Brett] is working on a video installation, and for the past few months, has been trying to get his hands on tiny CRTs any way he can. After initially coming up short, he happened across a karaoke machine from 2005, and got down to work. Karaoke machines of this vintage are typically fairly low-rent affairs, built cheaply on simple PCBs. [Brett] found that the unit in question was easy to disassemble, having various modules on separate PCBs joined together with ribbon cables and headers. However, such machines rarely have video inputs, as they’re really only designed to display low-res graphics from CD-G format discs. While investigating the machine, initial research online proved fruitless. In the end, a close look at the board revealed just what [Brett] was looking for – a pin labeled video in! After throwing in a Raspberry Pi Zero and soldering up the composite output to the karaoke machine’s input pin, the screen sprung to life first time! This initial success was followed by installing a Raspberry Pi 3 for more grunt, combined with a Screenly install – and a TRS adapter the likes of which we’ve never seen before. This allows video to be easily pushed to the device remotely over WiFi. [Brett] promises us there is more to come. Karaoke is a sparse topic in the Hackaday archives, but we’ve seen a couple builds, like this vocal processor. If you’ve got the hacks, though? You know where to send ’em. Sony had pocket TVs. Screen may have been 2″ diagonal or a bit more. Too small? The Sony Watchman. Some had side-firing CRTs in them. Tandy (Radio Shack) had one too. Thanks a bundle for that picture (and the description that goes with it). I recently picked up an old doorphone which has the exact same screen in it, and I couldn’t find any real info on it. Mine sadly hasn’t got fancy external connectors, though – just a ribbon cable. Sony makes some real nice crt color monitors intended for studio use. I think about 4”. They sell pretty cheap on eBay and can be battery powered too. Nice tip – I’ll keep that in mind. The Sony PVM-411 has four high resolution 4″ monochrome CRTs in a nice rack mount enclosure, although the monitors can be easily removed and used individually. They usually go very cheap on eBay. I picked up two and have one in a rack just for fun displaying camera feeds. Amazing, thanks! They’re still a bit pricier than I want to spend right now, I’m nactually just prototyping, but if prototyping goes well I might pick them up and use them instead. Looks like prices have gone up… I got mine for $49 each ($12 per monitor) plus shipping, about 2 years ago. Old camcorders. 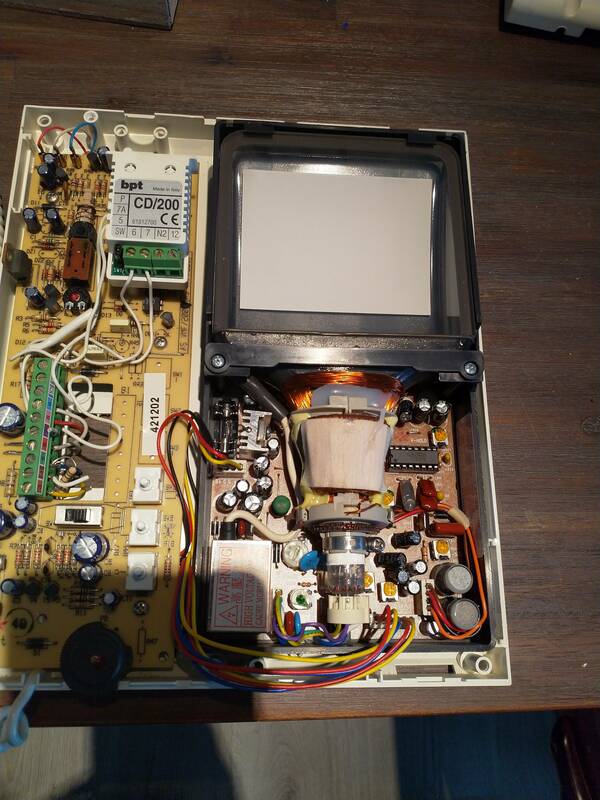 One inch crt and a tiny high voltage driver too. Somewhere in the depths of the HaD archive if I recall. Really tiny,practically useless, analog oscilloscope. Maybe a larger one would be better, if less portable. Head mounted, for when you suddenly need to probe on the go. Sweet! I wish I knew ya Brett as I have three or four old Sony Watchmans. Also, is it just in my area or does Walgreens and Wallyworld not sell those lil emergency all in one TVs elsewhere? Some are color and some are B/W but all run on batteries. Enjoy, Brett. I can’t help but think I would try and sing the code in my head haha. I have used portable TVs as impromptu screens for diffrent projects where aesthetics called for them. Looks like a TRRS jack to me. Some of the fancier Karaoke machines had color CRTs. I’ve seen them but so far no luck googling up any info, aside from one sold through WalMart with a description that claims it’s color CRT but obviously has a LCD. I bought 3 5″ color CRT TVs from goodwill for $5 each and they all have the same 320*240 CRTs with a totally flat face and they are the nicest looking CRTs I have ever seen. I used them to play plug n plays on. What are the make and model(s) you’re referring to? I picked up a B&W GFM 505-BWRW for $5.99 that I thought would be handy since smaller than the SR3000 I picked up for I think $8. Neat little devices I’ve thought about expanding their capabilities with and have a little digital to analog converter, some baluns and adapters for connecting different inputs and antennas to. Interesting article that gets me thinking about the karaoke machine could do some signals processing coupled with the all in one TV’s. Our Goodwill no longer takes any CRT’s and no flat screen thicker than 4 inches (1DM), however a one of a kind place has 3 or 4 of these extinct things. one is karaoke others are just TV’s and one is a jam box with the TV. Over just a couple hours I converted a little 5 incher into an oscilloscope. I would like to get the jam box TV and do it so the visuals can have sound. Karaokes are usually mono. Another source might be old-style door entryphones. Video entryphones would have had small monochrome CRTs in them at the indoor end. similarly, Mitsubishi VisiTel videophones have good CRT’s in them; they’re about 4″ diagonal/visible. I’ve been using Portable DVD plays as displays. And the remote display is even better. Yeah, they are nice. I have two Haier HLT71’s that are great, $4 for the one though I bought the second for around $25 to get the remote and all the other kit that was stock and functioning to compare to. I picked up a Philips PD9012P/37 for $5 and didn’t realize the screen next to it was the complimentary screen since is a dual screen kit. Went back the next day and was gone. They are nice… though I am more into using for signals work to make a standalone system. The CRT emergency systems seem to be the best all around COTS’s for signals in general I’ve found for way cost effective. I’m thinking though the Portable LCD’s can be hacked to have more radio functionality with say a HackRF and microcomputer. The later noted more effective if using a linear power supply and an LED or really OLED since emit less noise if I understand correctly. I think that is correct. Please correct me if I am wrong.